← Is the Left Capable of Governing in Europe? The bacterium that causes bubonic plague or Black Death, Yersinia pestis, is a relatively new species. Research suggests it diverged from its nearest living bacterial ancestor no more than 6,400 years ago. During this transition, the genetics of Y. pestis changed. Most notably, it acquired genes that helped it survive inside fleas. However, a big mystery remained. The ancestor from which Y. pestis evolved, called Yersinia pseudotuberculosis, is deadly to fleas. The bacterium causes lethal diarrhea in about 40% of them. Now, researchers report in the journal PNAS how a key mutation in Y. pestis fixed this problem and aided the bacterium’s ability to spread worldwide. Relatively limited prior knowledge of the pathogenesis of Y. pseudotuberculosis meant the authors had to go on the molecular biology equivalent of a scavenger hunt. Using a process called cellular fractionation, in which the bacteria were chopped up, separated into various parts, and fed to fleas, the authors found the toxic protein resided in the bacterial membrane. 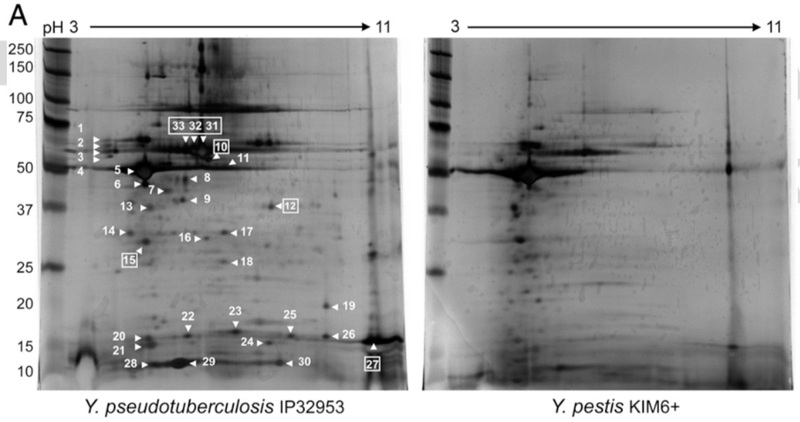 Then, the authors further separated the proteins using gel electrophoresis (see image) and identified the proteins whose expression differed between Y. pestis and Y. pseudotuberculosis. Their hunt eventually narrowed in on protein #12 (see image), which they identified as an accessory protein to an enzyme called urease. Specifically, the protein accessory is called UreD. And here, the authors struck gold. In Y. pseudotuberculosis, the ureD gene is functional; in Y. pestis, it is mutated and nonfunctional. The result is a broken urease enzyme in Y. pestis. Presumably, urease (which breaks down the chemical urea to produce ammonia) poisons the flea. This would explain, therefore, why Y. pseudotuberculosis causes a lethal diarrhea, while Y. pestis does not. Driving their point home, the authors restored ureD function in Y. pestis. As predicted, Y. pestis with functional urease killed many of the fleas. Thus, the authors concluded that there exists strong evolutionary pressure for Y. pestis to lose its urease activity. As microbiologist Stanley Falkow famously said, “The goal of every bacterium is to become bacteria.” For Y. pestis, achieving this goal is facilitated by dropping the urease enzyme because it allows more fleas to survive. And the more fleas that survive, the more rats (and humans) that can become infected. It should be noted, however, that though the mutation in ureD makes Y. pestis nontoxic to fleas, the little insect still does not escape unharmed. Instead of causing diarrhea, Y. pestis forms a biofilm inside of the flea’s digestive tract. This causes the flea to regurgitate its blood meals, which in turn has two effects: First, it facilitates transmission of the bacterium from inside the flea gut to rats and humans; second, it causes the flea to die slowly from starvation. As it turns out, the evolution of Y. pestis was of little benefit to any species other than itself.